Decaffeinated Green Coffee Bean Extract supports your metabolism to help burn fat more easily. Decaffeinated Green Coffee Bean Extract is a clinically proven weight management product, sourced from coffee beans. The active ingredient, chlorogenic acid supports stable blood sugar levels and encourages the use of stored body fat as fuel in preference to carbohydrates. Stabilising blood sugar levels helps support a controlled appetite and reduced food cravings. 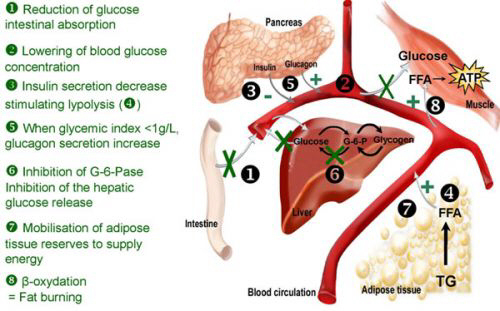 Chlorogenic acids reduce the amount of blood sugar assimilated from the intestinal tract which lowers blood glucose levels. The body subsequently searches for an energy supply other than glucose. Body fat reserves are then targeted for energy and are burned off preferentially. In a recent clinical trial, with fifty individuals with a Body Mass Index (BMI) of greater than 25 over a 60 day time period there was substantially better weight loss and a related decrease in Body mass index in individuals consuming decaffeinated green coffee bean extract. What makes the study so exciting is that the test participants did not modify their diet plans or exercise regime. However those that were taking the green coffee bean extract found it twice as effective as those taking the placebo. This is a really significant outcome. Good Health Svetol 2800 is the only green coffee bean extract product that utilizes the correct ingredient, at the accurate dose, just the same as used in the clinical trials. Decaffeinated Green Coffee Bean Extract has been scientifically investigated to support weight and body fat management. The active ingredient, Chlorogenic acid, works to support stable blood sugar levels and promotes the use of stored body fat instead of carbohydrates as the favored source of fuel. Many people find that diet and exercise is not always sufficient and hit a wall in controlling their weight. Controlling blood sugar levels also helps to support a healthy appetite and handle food cravings. Svetol 2800 assists with healthy weight management and glucose metabolism. It is also guaranteed NOT to contain cafestrol or kahweol which have the potential to increase cholesterol levels. Directions: Take 1 capsule before food twice a day. Presentation: Each pack contains 56 capsules - Also available in a 112 capsule pack size. Precautions: Good Health Svetol 2800 is not suitable for children, pregant or breastfeeding women. Contains NO gluten, artificial flavours, sweeteners, preservatives or colouring agents. Always read the label and use only as directed. If symptoms persist consult your healthcare professional.